The nose initially offers spice with a little smoke. Eventually honey, vanilla and fruit notes emerge. There is an engaging depth to this Whisky. The palate comes alive with fruit and spice before a briny note appears. The finish is long, with a peppery flavour and lasting charm. Other - Nose: Classic, crisp, mineral Highland aromas of herbal honey and brittle barley. Beautifully fragrant and vibrant with a touch of dusty oak and a late earthiness and herbal smokiness. Palate: A little more milky, creamy oak encroachment but the minerality of the spirit stands up to it. A touch of herbal honey and barley comes through leading the way for the return of the citrus and minerality. Finish: The finish is long, minerally, citric and mouth-watering. Comment: Now that's the sort of Highland whisky I like! Nose: Sandalwood and spice. An antique wardrobe in the bedroom of an old British country house: laundered sheets, cedar wood and lavender. A single malt from Narnia perhaps? Palate: Delicate and slight influence of the wood on the spirit, leaving a fragile whisky, but not in a bad way. Vanilla and green herbs infuse the spirit and there is a touch of old-school whisky making in this palate. Finish: Grapefruit juice, cinnamon and vanilla custard. Comment :Like a butterfly in your hand – delicate and beautiful but fleeting and flighty. The name and the history of Clynelish (the first syllabe rhymes with "wine" and the second with "leash") are closely associated to the adjucent distillery, Brora. It was built to augment the capaicity of the neighbouring, century-old Brora distillery, but eventually, demand proved insufficient to sustain both in production. Brora was eventually mothballed in 1983. Clynelish is settled in a rural setting with a still house with great windows overlooking to the fishing and golfing resort of Brora. 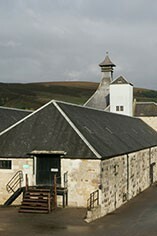 Its buildings are the exact replica of the Islay distillery, Caol Ila. Clynelish is Sutherland’s only distillery. It was established in 1819 by the Marquis of Stafford who was later granted the position as the first Duke of Sutherland. Originally, it was used as an outlet for cheap grain which he obtained from his tenant farms during the Highland clearances. In addition the location was selected due to its proximity to Brora coal field that had operated since the 16th century. As such, it was one of the first purpose-built distilleries, commencing production in 1821. In the mid-19th century the distillery was improved and extended by George Lawson, who, with his sons, was responsible for the combination of running the distillery in parallel with farming for 50 years. During his visit in 1886, Alfred Barnard reported that Clynelish whisky was a tremendously fine spirit, and was to be highly regarded by its consumers. Thus the distillery supplied only private customers throughout the kingdom. The recession of 1931, following the American depression, forced Clynelish to close and full production was not restored again until the end of World War II. Electricity replaced coal at Clynelish in the 1960s and, in 1968; a new neighbouring distillery was added. The two distilleries operated alongside each other up until 1983, when the original one was closed. The whisky from the original distillery was sold as ‘Brora’ and subsequently now is available only as a highly sought after collectible. Clynelish single malt whisky was selected by Diageo as one of its ‘Hidden Malts’ in 2002. The team at Clynelish claim to produce their own genuine brand of liquid gold – not just because of the quality of the whisky – but because the water drawn from nearby Clynemilton Burn runs over veins of gold on its journey down Col Bheinn. It operates a copper-domed, full Lauter mash tun, eight larch washbacks, two stainless steel washbacks and six large stills. The spirit stills are unusually larger than the wash stills. Barley is supplied medium-peated from Glen Ord’s maltings, and the current Clynelish spirit is far less peated that Brora. 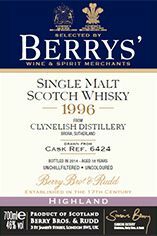 Clynelish is a classic case of a coastal malt having a slightly "island" character (it uses a medium peating), noted for its oily, beeswax flavour profile. A long fermentation and slow distillation, coupled with a precipitation of natural oils in the low wines and feints receivers, contribute to the spirit’s uniquely waxy character.